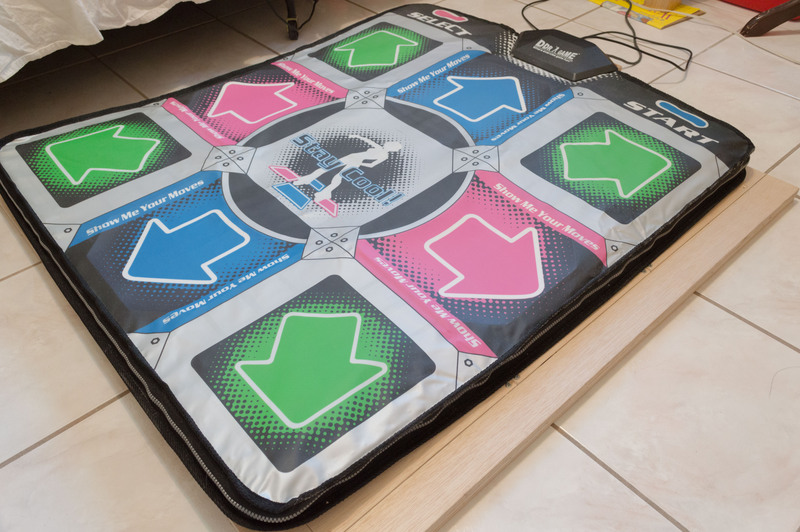 This is a controller mat for the video game “Dance Dance Revolution”. To play this game, the user must step on the up/down/left/right directional pad in sync with the arrows on the screen. Many consumer foam pads (pictured above) degrade quickly with use, so I opted to construct my own. It is made from a Playstation One controller, aluminum roofing tiles, and plywood. I took apart the Playstation controller and soldered wires to the copper pads corresponding to the Up, Down Left, Right, and Ground terminals. The copper pads on the controller are very fragile and can break off easily. I placed alligator clips on the wires and hot glued everything in place. 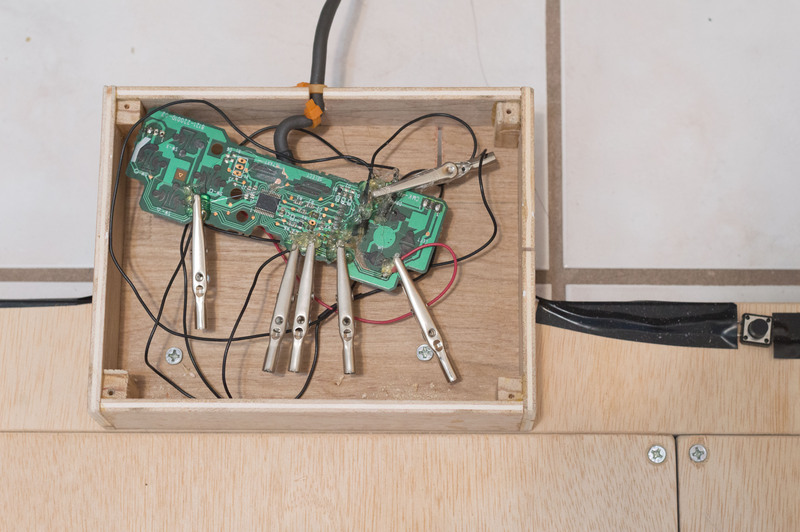 The wires were then routed through grooves in the plywood and then soldered onto aluminum plates. For each button, there is a ground plate and a direction plate. The grounds for each button are all joined together. For a step to be registered, the ground plate and the direction plate must have electrical contact to complete the circuit. 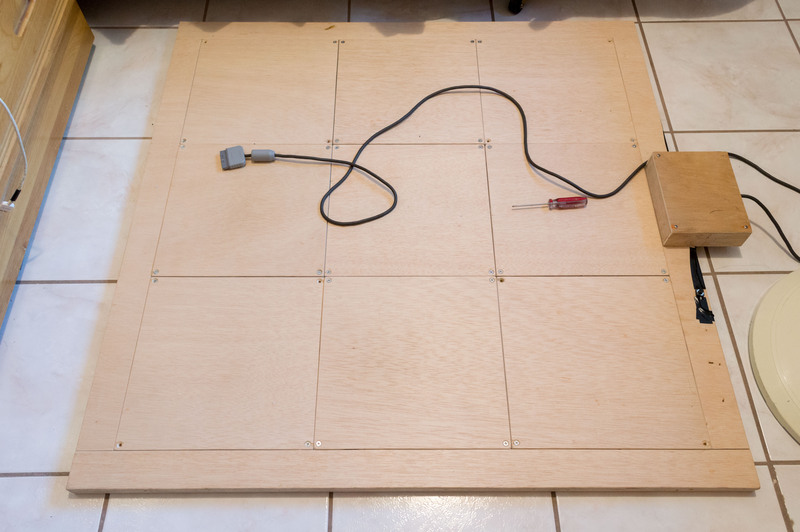 To facilitate electrical contact, I made a wooden square that floats on top of the aluminum plates. I taped an aluminum plate on the underside of the square. On the edges and corners, there are grooves with high density insulation foam. When the square floats over the plates, there is no contact. 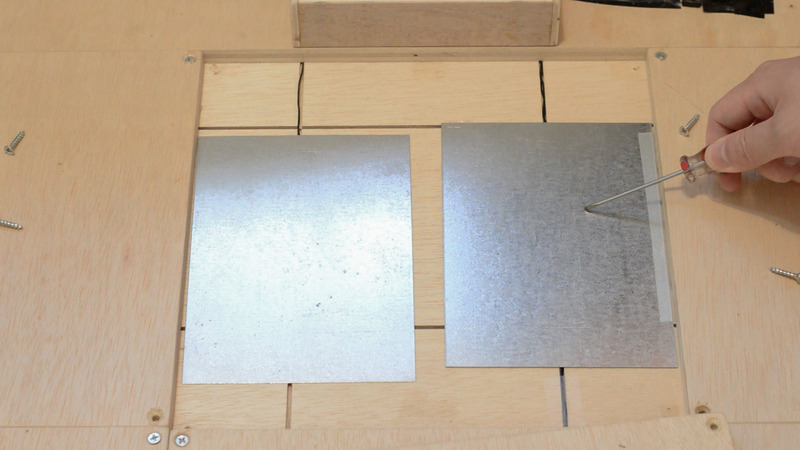 When I apply pressure to the wooden square, the plates touch each other and registers the step. 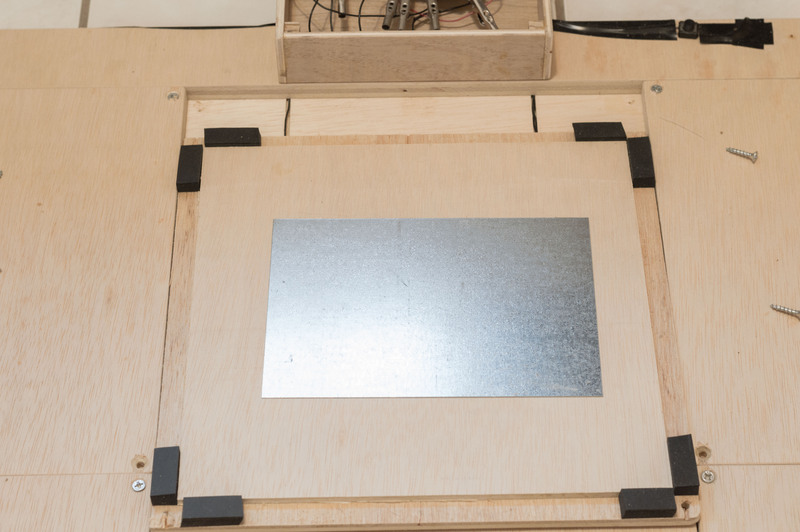 The foam then pushes the plates apart and opens the circuit again. To adjust the sensitivity of the system, I loosely screwed the wooden square onto the base. By turning the screws, I can bring the metal plates closer together or father apart, thus adjusting the foot pressure needed for a step.